A celebrated raconteur and art activist, the long-lived Theresa Bernstein may be the only artist to have made and exhibited work in every decade of the twentieth century. 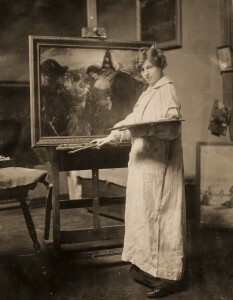 Exhibiting during the 1910s, Bernstein witnessed critics compare her work to that of Robert Henri and his circle for its forceful brushwork and realist approach. Despite this early acclaim, as is true for most women artists of her generation, Bernstein’s work has not yet received the attention it deserves. Nonetheless, her work has gradually made its way into important museums including the Metropolitan Museum of Art, the Art Institute of Chicago, the Philips Collection, and the Smithsonian Museum of American Art, among many others. Bernstein remained committed to figuration throughout her long career. Her desire was always to connect with real life and to be a painter of the people. Theresa Bernstein: A Century in Art, resulted from research begun in an exhibition seminar in the art history doctoral program that Distinguished Professor Gail Levin taught at the Graduate Center of the City University of New York in the fall of 2010. The students, all of whom contributed research for the exhibition, book, and website, were Sarah Archino (CUNY Ph.D., 2012), Diana Fischman, Stephanie Hackett, Elsie Heung, Gillian Pistell, and Lindsay Smilow. Two scholars, who had each written about Bernstein’s art, organized a show of her work, and befriended her, visited the seminar and shared their expertise: Dr. Patricia M. Burnham and Dr. Michele Cohen (CUNY Ph.D., 2002), the latter of whom also served as a consultant to the project. Essays by Sarah Archino, Patricia M. Burnham, Michele Cohen, Stephanie Hackett, Elsie Heung, Gail Levin (editor), and Gillian Pistell appear in the catalogue, Theresa Bernstein: A Century in Art. The exhibition will communicate many dimensions of the complex urban metropolis that is New York as well as the life of Gloucester, MA, the small seacoast town and artist colony, where Bernstein and her husband worked during the summers. Themes include Bernstein’s observations of political activism such as woman’s suffrage; economic hardship as shown by out-of-work women at an employment office; spiritual life as exemplified by people in the congregation of a Polish immigrant church; and cultural pursuits by artists from visual to musical performers. This website, which serves as the online component of the catalogue and exhibition, was created and is maintained by art history doctoral candidate Elsie Heung with the resources, support, and encouragement of Faculty Advisor Gail Levin and the CUNY New Media Lab, along with the contributions of many individuals and organizations. It is the online component of the catalogue accompanying the traveling exhibition. We seek to make visible the work of an erased woman artist and to show how her art reveals some of the major issues of her time– social, economic, religious, and cultural– in American life. This is not a catalogue raisonne, but an effort to share our research from the book and exhibition project, Theresa Bernstein: A Century in Art. It is our hope that this site will serve as a useful resource for scholars and the general public, and that it will encourage further research into the life and work of a remarkable artist.